This post is about the Alberta Prosperity Certificate, one of the world's stranger monetary experiments. Issued in late 1936 and early 1937 by the newly-elected Alberta government, these monetary instruments are the largest-scale example of Silvio Gesell's "shrinking money," or stamp scrip, in action. Gesell, a German business man and self taught economist, had written a treatise in 1891 in which he described a currency that depreciated in value, thus preventing hoarding and encouraging spending. To make this more interesting, let's jump forward in time. In 2014, Greece's Finance Minister Yanis Varoufakis wrote a blog post that described a new Greek financial instrument that could be used to make payments while circulating in parallel with the already-existing euro. Varoufakis's post, combined with constant rumors that Greece may be planning to issue its own parallel currency in order to make internal payments,* means that a revisitation of Alberta's early dalliance with scrip, which circulated concurrently with Canadian dollars, is more relevant than ever. The attempt by Albertan authorities to issue scrip 80 years ago would end in failure; most of the paper refused to stay in circulation. Understanding why this happened provides some insights into what sorts of conditions might promote the success of a Greek parallel currency—or its downfall. The best source on Prosperity Certificates is a 1938 survey by Virginius Frank Coe, an American economist who visited Alberta in August 1937, five months after the program had been abandoned. Coe's life is interesting enough to deserve its own tangent. An economist educated at the University of Chicago, Coe would go on to hold a number of important positions in various U.S. government institutions both during and after World War II, including monetary research director at the Treasury Department. This brought him into the orbit of Harry Dexter White, then the Assistant Secretary of the Treasury and the architect of the Bretton Woods agreements. Coe himself was a representative at Bretton Woods and would go on to become secretary of the International Monetary Fund in 1946, nine years after having written his Prosperity Certificate paper. Readers of Benn Steil's The Battle of Bretton Woods will know that much of the evidence incriminates Harry Dexter White as spying for the Soviets, an accusation White himself denied. The same sources who named White as a Soviet agent also fingered Coe, and in 1952 Coe was forced to resign from his post at the IMF. He would appear in front of the McCarran Committee later that year, pleading the fifth in response to all questions posed to him, and would later face Senator Joseph McCarthy. His passport revoked, and unable to find work in the U.S., Coe headed to China to serve as an adviser to Mao until his death in 1980. Coe's Prosperity Certificate paper betrays the author as someone with a strong interest in alternative monetary systems. While we can't know for sure if his interest in alternative systems extended as far as being a Soviet mole, we shouldn't let this possibility detract from what is otherwise an excellent account of this early Canadian monetary experiment. Coe describes an Alberta electorate that is facing the same economic backdrop as Greece's voters did prior to the recent election of Syriza. 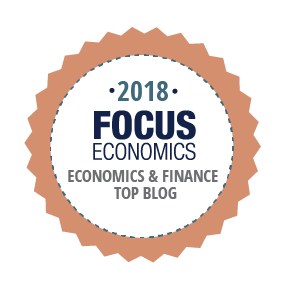 Just as Greeks had endured seven years of famine prior to the 2015 election, Albertans going into the 1935 election had been beset by seven years of distress associated with low farm prices and bad crop yields. The incumbent United Farmers of Alberta government was not willing to implement the more drastic policies that the Albertan electorate demanded, says Coe. Into the void stepped William Aberhart, a pastor and newly-recruited believer in the tenets of Social Credit. Dreamt up by British engineer C.H. Douglas, the idea behind Social Credit was to create a more equal society by augmenting consumers' purchasing power via the payment of a national dividend. Aberhart formed the Alberta Social Credit party in 1935 and won the election a few months later. In electing Syriza, the Greeks, like the Albertans before them, have entrusted their future to a party of political novices. Reading Coe, one gets the sense that the Aberhart government stumbled into Prosperity Certificates rather than purposefully selecting them as a policy. Gesell's dated stamp scrip was a rival monetary reform to Social Credit, not a complement. Why turn to a non-Social Credit policy? It seems that several months after coming to power, the new Social Credit government was already splintering as one faction had grown impatient with Aberhart's inability to implement economic changes. Coe, speculating that the decision to implement dated stamp money was a token gesture to demonstrate forward momentum and heal internal rifts, says that "any one of a number of plans would have done as well." If a non-Social Credit monetary scheme such as Gesell money were to fail, at least a Social Credit policy option still had a kick at the can. The implication that the government didn't put much thought into the design of the certificates finds some confirmation in the fact that the Free-Economy League, an organization formed by Gesell, published a criticism of the Alberta government's procedure for creating Prosperity Certificates and predicted their failure. 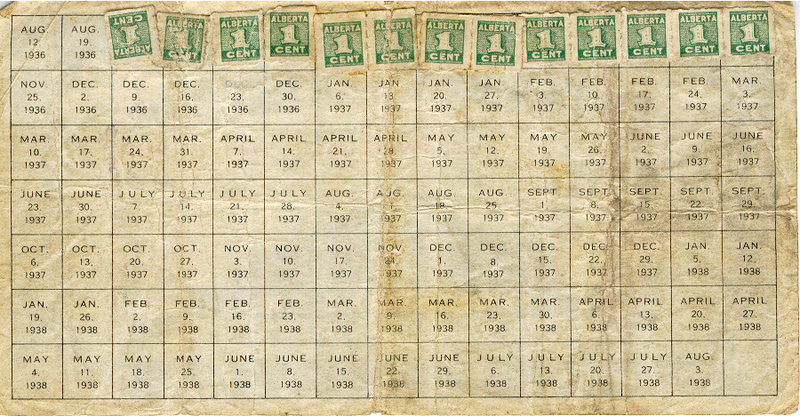 Here's how Alberta's stamp scrip worked. In early August 1936, when the program debuted, an unemployed Albertan was paid, say, a $1 certificate for each $1 worth of road maintenance work rendered. This certificate was to be redeemed by the Alberta government two years hence, or in August 1938, for $1 in Canadian dollars. However, redemption required that the certificate have 104 stamps affixed to it (see figure above). Each week during that two year period, the owner of the certificate was to buy a government stamp for 1 cent from an approved stamp dealer and glue it to the note. The necessity of buying stamps created a fairly onerous fee on cash holdings. As such, any laborer who received the scrip from the government was unlikely to hoard it, preferring instead to spend it on, say at a retailer, who in turn would only accept scrip as payment for goods and services if the correct number of stamps has been affixed. In order to avoid the cost of buying the next weekly stamp in order to keep the scrip current, the retailer themselves would quickly offload it to their suppliers and so on. The 1 cent stamp fee was collected by the Alberta government and held as a reserve for redemption in two years. With 104 cents being collected over each $1 certificate's life time, this meant that the scheme was entirely self financing. The extra four cents represented a profit to the government. We know that the Prosperity Certificate scheme didn't work. The certificates began to be paid to unemployed Albertans in August 1936 for roadwork rendered in July. According to Coe, the maximum amount of outstanding certificates in circulation in August and early September was $239,391 (around $9 million in current dollars). However, by mid-September 1937, just one month after the program's debut, over 60% of the certificates outstanding, or $144,280 out of $239,391, had ceased to circulate. Where had they gone? The government now held them. The reason for this development was a last minute decision by Aberhart to offer monthly redemption of certificates at par in Dominion currency (i.e. $1 in certificates for $1 in Canadian bills). This short-circuited the original two-year life of the certificates. Rather than continuing to pass the scrip along to the next Albertan, Albertans leapt at the government's offer and converted en masse when the first redemption date presented itself in early September. In the end, the government might as well have paid for work rendered using Canadian dollars, since the net effect of paying in either Certificates or Canadian dollars was the same. As Coe says, "the dated stamp scrip was in the end little more than a small nuisance." Subsequent issues of scrip were small relative to the original August 1936 issue and the government officially ended the program in April 1937. "The problem of the wholesalers"
In the planning stages of the program, government officials ran into what Coe refers to as the "problem of the wholesaler." The first to receive the certificates would be farmers on relief, who in turn would make payments to retailers. The payments by retailers would primarily flow to Albertan wholesalers whose dominant payments were to manufacturers and others outside the province. However, those outside the province would not accept Prosperity Certificates, requiring instead hard currency, or Canadian dollars. The Albertan wholesaler would be left holding the bag, so to say, having acquired the entire issue of Prosperity Certificates with no outlet. According to Coe, wholesalers and large retailers were vocal in their opposition to the plan, which they expressed through trade associations and in the press. One way of solving the wholesalers' problem would have been to establish an exchange market such that wholesalers could sell certificates in order to buy the necessary hard currency and thus fund out-of-Province imports. Banks would normally be an important party to the creation of such a market. Irving Fisher, who wrote a book on stamp scrip, entitled one paragraph "Have at Least one Bank." But the banks who operated in Alberta refused to participate in the Prosperity Certificate scheme—no wonder given that one of the Social Credit party's planks advocated the removal of the "banking monopoly" on the issuance of credit. The tenets of Social Credit thus interfered with the execution of Gesell money, impeding the latter's success. Even if such a market were to be created, chances are that it would have priced the Certificates at a large discount to Canadian dollars given the onerous fee on certificates relative to Canadian notes and the inferior credit of their issuer. After all, by then the Alberta government had defaulted on its international obligations whereas the Federal government's credit was still good. Such a discount would have been at odds with the Alberta government's policy of using a dollar's worth of certificates to buy one Canadian dollar's worth of labour. If the certificates were trading at 69 cents on the dollar in the wholesale market, workers paid in scrip would be loath to accept them at face value, for if they did, they would probably have problems passing them off at retailers for that amount. In the end, the government's solution to the problem of the wholesalers was to allow wholesalers (and even retailers) to benefit from free monthly redemption at par. As I noted earlier, this resulted in most of the certificates being returned for redemption just a few weeks after having been issued. ** Rather than bad money driving out the good, a garbled version of Gresham's Law had taken hold in Alberta, which Coe describes thusly: "Bad money obviously does not drive out good money when the government is willing to redeem the bad money in good money." This garbled version of Gresham's law is a phenomenon I've described before to explain a number of monetary puzzles including the failure of the Susan B. Anthony dollar, the European Target2 bank runs of 2011-12, the proliferation of credit cards, and the zero-lower bound problem. See here and here. Alberta in 1936 and Greece in 2015 are in similar situations. Both are non-currency issuers within a larger monetary zone, in Alberta's case the Canadian dollar zone and in Greece's case the Eurozone. Both have awful credit. Neither is part of a larger fiscal union. In Greece's case, the mechanism hasn't yet been created whereas in Alberta's case, the Social Credit party was at such odds with the Federal government and the rest of Canada that it could not expect much help. I'd argue that anyone planning to introduce a Greek parallel currency to circulate alongside euros faces the same problem that Alberta faced; the so-called problem of the wholesalers. If the Greek government starts to pay employees and contractors in Greek parallel IOUs denominated in euros, and employees buy stuff at stores with those IOUs, and stores purchase inventory from wholesalers, these wholesalers will need a mechanism to offload their parallel note surpluses in order to get euros to buy foreign imports. The IOUs can either find their own price, in which case they will most likely trade at a large and varying discount to euros, or the Greek government can offer one-to-one convertibility. They can do this by either redeeming IOUs directly for euros or allowing one euro worth of taxes to be paid with an equivalent number of IOUs. Neither solution is ideal. If the IOUs trade at a variable discount to euros, then their ability to serve as a competing medium of exchange will suffer. People always prefer to trade using the medium in which a nation's prices are expressed, or, put differently, the medium which functions as a unit of account. For example, people see benefit in the fact that one euro will always discharge a euro's worth of Greek debt or a buy a euro's worth of Greek olive oil. But as long as Greek IOUs trade at a varying discount to euros, it is impossible to know ahead of time how many IOUs will discharge a euro's worth of debt or buy a euro's worth of oil, given that the euro will surely remain Greece's unit of account. This would hinder the IOU's ability to function as a currency. The fact that people prefer to accept stable exchange media in trade to unstable media is one of the reasons that bitcoin hasn't caught on. So rather than serving as a competing medium of exchange, the parallel IOUs will probably function as illiquid and highly risky speculative fixed income securities. In order to compensate recipients of IOUs for this lack of liquidity, the Greek government will have to issue the IOUs at a larger discount to par than they would for an otherwise liquid equivalent, thus increasing the government's financing costs. This lack of liquidity militates against one of the key selling points of a Greek parallel unit, which is to finance the government by displacing some of the existing circulating medium of exchange, euros, from citizens' wallets. Preferably, unwanted euros would trickle back to the European Central Bank to be cancelled, reducing the ECB's seigniorage but augmenting the seigniorage of the Greek state as Greek IOUs rush in to fill the void. However, if the new Greek parallel unit cannot compete with the euro's liquidity, then there will be very little 'space' for Greek IOUs to occupy in Greek portfolios, and little relief for beleaguered government finances. In sum, anyone planning a Greek parallel currency faces a conundrum. In order to pay its bills the government can do little more than introduce a volatile asset that trades at varying discount to euros. This asset's volatility and relative illiquidity won't make it very popular with its recipients. An attempt to render that asset more acceptable in trade by setting a one-to-one conversion rate to the euro will result in a short-circuiting of the scheme as everyone races to redeem IOUs. The issuance of parallel currencies seems like a hard battle to win. ** Compounding the problem was that redemption at face value put a premium upon redemption, says Coe. "The holder who redeemed received face value; the person who did not redeem ran the risk of losing 1 per cent of the face value if he failed to pass the certificates within the next few days, and more for longer periods. This premium placed upon redemption could only have been eliminated by redeeming the certificates at a discount of more than 1 per cent-say, 2 or 3 per cent." So the government accidentally created an even greater incentive for certificate owners to redeem. *** This is particularly damaging in Greece's case at will result in a perpetual draw down in the state's euro balances. These reserves are vital since the Greek government needs to service its (existing or renegotiated) Euro debts to the IMF and pay external suppliers, and can only do so with hard currency. Truly excellent post JP. Both topical and historical, and both empirical and theoretical. 1. The direct improvement in Greek government finances, as you mention. 2. It would help get Greece out of recession, by alleviating the excess demand for money in Greece (and thus create an indirect improvement in Greek government finances). In Present Value terms, even at a 0% nominal interest rate, each Prosperity Certificate would be worth minus 4 cents if held and stamped to maturity. Nobody would want to accept them at any positive value unless they were *more* liquid than Canadian dollars. Thanks Nick. High time for more CanCon on my blog. "Nobody would want to accept them at any positive value unless they were *more* liquid than Canadian dollars." Yes, I agree. One reason I think that stamp scrip has been accepted in the past despite its awful return (and relative illiquidity) is that scrip has often been a community effort so there are significant social pressures to accept. "2. It would help get Greece out of recession"
Here's a question for you. If the ECB is running a contractionary policy such that Greek sticker prices are being pressured downwards and stuff is going unsold, will Greek IOUs be sufficient to offset the problem? Assume that Greek retailers continue to set prices in terms of euros and that Greek IOUs are of poor quality so that they trade at a discount to euros. JP: I think so. If they trade at a discount, the increase in real M/P will be smaller than it otherwise would be, but issuing enough of them should still prevent the excess demand for the medium of exchange. This reminds me of American colonial currency, which circulated beside British currency from 1690 until about 1750. Some of the early American currency bore positive interest, rather than negative interest like the Alberta certificates. The interest payments were abandoned in later issues. It seems that any interest on paper money, either positive or negative, is not practical. The American currencies did circulate, largely because they were accepted in tax payments. Some currencies were stable and some were volatile, depending on the probity of the issuing colony, but they circulated either way. I don't see why Greece couldn't to the same thing. Mike, how did they manage to pay interest on paper currency? Did people have to go into an office each week in order to get paid? Greece could allow for tax acceptance, say 1 IOU discharges 1 euro in taxes. But everyone will decide to pay their taxes (and prepay them too) in Greek IOUs rather than euros, since IOUs are being overvalued relative to euros. As a result, the Greek government won't have the foreign exchange (ie. euros) necessary to pay upcoming debts to the IMF. A colony would declare that its bills would be accepted at a 5% premium when paying taxes. In New York, "an allowance of 2.5% was voted every 6 months that the bills remained in circulation before being paid in taxes". More details available from Curtis Nettels, Money Supply of the American Colonies, p. 263, and from Eric Newman, The Early Paper Money of America, p. 15. Your second paragraph confuses me. Why assume Greek IOU's are overvalued? If they aren't, then the problems you mentioned don't follow. The American colonies, by the way, faced a host of valuation issues. They initially declared that NY shillings would be accepted for taxes 1:1 with English shillings. A few years later, they'd find that english shillings disappeared from circulation, so they'd revalue to 1 NY shilling=.7 English shillings, and English shillings would flood back into the colonies. A few years later the process repeated, until after 50 years the NY shilling had lost 90% of its value. Interesting. Setting a premium is how Varoufakis's proposal is structured. "Your second paragraph confuses me. Why assume Greek IOU's are overvalued? If they aren't, then the problems you mentioned don't follow." A Greek IOU denominated in euros will never be worth as much as an equivalent German-issued IOU denominated in euros because of credit risk. It should trade at a discount. If the government is willing to accept Greek IOUs at par rather than at a discount, then it is overvaluing those IOUs. This flows through into your last paragraph. If the government forces merchants to accept Greek IOUs at par as well, then it is requiring everyone to overvalue them. Merchants will react by increasing their sticker prices in defense, which will effectively remove the overvaluation of Greek IOUs but will instead undervalue euros. Gresham's law ensues and Euros will vanish from circulation. That could explain why English shillings disappeared in your example. "Preferably, unwanted euros would trickle back to the European Central Bank to be cancelled, reducing the ECB's seigniorage but augmenting the seigniorage of the Greek state as Greek IOUs rush in to fill the void." If such a thing were possible, it would be grounds for ejecting Greece from the euro system. Meaning that Greece would lose its share of ECB seignorage (which may be minimal today, but we assume will be higher in the future when interest rates are higher). Possibly a net loss. "You pay, say, €1000 to buy 1 FT-coin from a national Treasury’s website (Spain, Italy, Ireland etc. would run their separate FT-coin markets) under a contract that binds the national Treasury: (a) to redeem your FT-coin for €1000 at any time or (b) to accept your FT-coin two years after it was issued as payment that extinguishes, say, €1500 worth of taxes." It's hard to say if it would trade at a premium or a discount. The market may set a high enough value on the option to extinguish 1500 euros worth of taxes two-years hence that they are willing to pay, say 1100 euros for FT-coin, a premium to their 1000 euro offer price. As long as the Treasury issues FT-coin at 1000 euros, it is providing investors a risk-free arbitrage. Suppose Greece starts to pay its employees with newly printed drachmas and also accepts them for tax collection. The greek central bank does not ensure convertibility between the two currencies (it accepts them as deposits but lets them float against each other). Also, it anounces that some years from now, it will only accept drachmas for tax payements. Could this allow Greece to have a more expansionnary monetary policy (using the drachma for QE) and to leave the eurozone long-term? It depends what you mean by long-term. Even if Greece floats a new drachma, it could take Greece many years to leave the euro. This is because usage of euros is locked into place thanks to network effects. Greece should issue 1 year 0% bearer bonds, accepting them as tax payments up to 50% of the tax paid. Increase the issue amount each year / quarter / month as needed. If it accepts 50% of taxes paid in IOUs, that means its euro income will be cut in half. It needs euros to pay its IMF and other external debts. So the number of IOUs it issues, and the proportion of IOUs it accepts in taxes, needs to be very carefully calibrated. Sorry for a late comment, I'm working through a backlog of stuff to read. Stability vs. unit of account: in my opinion, you insufficiently distinguish between "stable price" and "unit of account". If I demand a medium of exchange because its price is the unit of account, that is not the same thing as demanding it because it's stable. For example, Ven claims to be very stable (it better be, as its price is based on an index), but nobody demands it for that reason. People prefer their existing own units of accounts even though they are less stable. The Euro, or the Swiss Frank were not particularly stable this year (and there are even less stable examples, like the Ukrainian Hryvnia and Russian Ruble). On the other hand, if the price of your national currency drops too much, people sometimes abandon it as a unit of account and switch to a different unit of account. Volatile vs. declining price: again, this is insufficiently addressed. There was literally no chance that the Alberta Certificates would appreciate against the Canadial dollar. It would only go down. So it does not follow that people abandoned it because it was volatile, it's a bad example in this context. Contrasted with other national currencies or Bitcoin, which may appreciate against the AC. And a final remark, which I already mentioned: this shows the conflict of goals a government faces with respect to money: on one hand, they want seigniorage, and this requires that their currency is liquid and people are willing to hold it for its liquidity. But if they provide liquidity (by redemption or accepting as taxes), they reduce the amount of circulating currency, and reduce their seigniorage. This is also why they face a conflict when dealing with Bitcoin: they want people to use fiat on one hand, but on the other they want to tell people how to use it. 2 years ago, as a reaction to the capital controls in Cyprus, I decided not to hold large amounts of money in deposit accounts and rather stick to Bitcoin. Fiat looks stable most of the time, except suddenly it isn't. Fiat also looks liquid most of the time, except suddenly it isn't. These extremes are the result of governments pursuing conflicting goals, and are not going away. Rather, they create publicity and demand for Bitcoin. There is no need for a plunge protection team for Bitcoin, because the governments provide a suicide team for fiat. Greece and IMF SDRs—Gold Next?